Excellent, energetic, exciting are some of the words used to describe Tabou Combo's rhythm guitar player, Jean-Claude Jean. An original member of the band, Jean-Claude Jean has been mesmerizing fans around the world for years with his style. He brings an impressive blend of talent and skills that has driven the band's striking sound for the last 40 years. Jean-Claude has created a style that is unique to him, and one that has become Tabou Combo's rhythm signature by combining different styles of Blues, Latin, Soukous, and Funk. 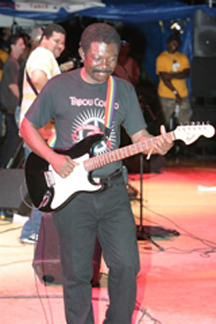 Jean-Claude is undoubtedly one of the most admired guitar players to have graced the world of Haitian Music.